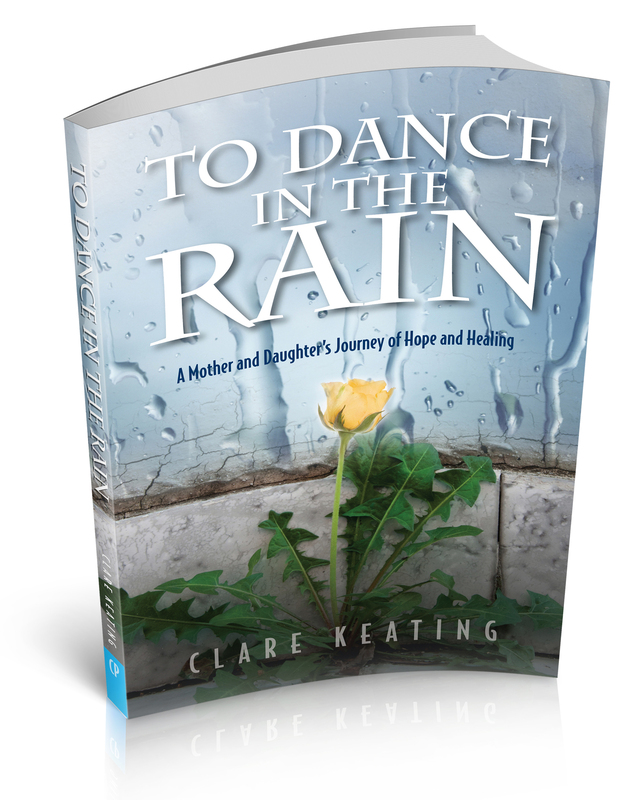 I would like to share one of the chapters of To Dance in the Rain – A Mother and Daughter’s Journey of Hope and Healing with you. It is Chapter 16 and is titled…The Christmas Roadtrip. 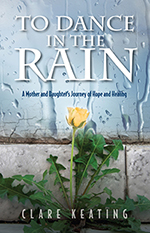 It is a story about one of our many challenges during the years that Alicia faced dramatic and frustrating limitations. The two of us traveled to Cleveland Ohio on Christmas Day 2002 with the goal of solving one of the many problems that Alicia had been facing since her brain injury in February of that year. I thing you will enjoy the story if you haven’t read it already, but may also enjoy rereading it. The thought of that trip still cracks me up. It’s entertaining but also a testament to hope and perseverance. ALICIA CONTINUED TO MAKE PROGRESS with her out- patient therapies in all areas except one. In physical therapy, she strengthened her muscles and even made progress with her equilibrium while walking the parallel bars. She still was unsteady but continued to make strides. Occupational therapy produced discernible differences as time went on. Although Alicia had problems with her fine motor coordination, which affected her ability to write, she continued to practice and gained more strength and coordination all the time. She was able to communicate through typing. My wonderful friend Sue Danaher is a speech therapist who I’ve known for years. We met because our children swam together on the same age-group team in Watertown. Sue inquired frequently about Alicia’s progress with her swallowing function. She taught me many things about the particulars of this not-so-simple reflex, which most of us take for granted. Every time we take a single bite a complex sequence of actions begins and allows us to swallow. Sue also passed along articles on the latest treatments being used to help people with dysphasia, or swallowing dysfunction. Being well read on all that was going on in her area of professional expertise, she told us about some of the research studies being done around the country and treatments that were on the cutting edge of her field. She encouraged me to look into this further. Alicia’s question of the day, all day, every day at that point was, “When do you think I will be able to eat again? Do you think I’ll be able to?” Alicia’s inability to eat became the priority, the situation that most needed to change. Sue and I narrowed it down to researching the particulars of two different studies underway in the United States. One was in Chicago, the other in Cleveland. They shared similarities in the mechanism used to stimulate the nerves in the throat, epiglottis and esophagus. Both programs were showing dramatic results. I also spoke with Alicia’s speech therapist at Gaylord, and it didn’t take long to see that we were all on the same page. We had exhausted every type of standard therapy in the area of dysphasia; we all agreed that making a move to one of the latest research programs producing some of the newer innovations in this area would be a good idea. We chose the program at the Case Western University Hospital Health System in Cleveland. The study was seeking participants with severe dysphasia. Pediatric speech pathologist Marci Freed was having very good results with her method referred to as E-Stim. The procedure involved placing electrodes near the ends of the five main cranial nerves that are involved in swallowing. A small current was then transmitted in sequence in order to stimulate the muscles involved in the swallowing process. The idea was to trigger the muscles to carry out their swallowing function. I got in touch with Marci Freed’s office at the beginning of December; they required some evaluations from anyone who had seen Alicia in regard to her swallowing function. Information was sent from Dr. Diane Fountas, her primary pediatrician, as well as speech pathologists at Yale and Gaylord. When all the information was reviewed, the group in Cleveland decided that Alicia would be a good candidate for their study. She’d had a devastating injury that left her with no swallowing function at all, yet she could communicate and cooperate with all aspects of this study. Many individuals with that extensive an injury also have problems thinking and communicating; Alicia was a helpful exception to the norm for them. She would be able to provide helpful feedback while participating in the research study. Alicia was approved, and we were in line to start the study at 11 am on Dec. 26, 2002. Excitement built as we made arrangements for our trip out to Cleveland. The length of our stay there was not set in stone; it would depend on the progress Alicia was making. The usual length of stay was two to three weeks. I lined up friends and family to help get Bryan and Crissy, to where they needed to go. The middle of basketball season meant they had busy sports schedules. Accommodations while we were out there were a concern at first, but we soon learned that there was a Ronald McDonald House within a few blocks of Rainbow Babies and Children’s Hospital, the part of UHHS where Marci Freed’s office was. We made reservations with that RMD House, and then we were ready to go. Money raised by the Village Striders and at the Holy Cross Ziti Dinner that year not only paid for the van with the wheelchair lift that we bought, which was now going to get us where we needed to be, the funds also covered travel expenses and the cost of staying at the RMD House. For the several weeks that we prepared to head for Cleveland, we were full of anticipation and quiet reserva- tions about what we believed was a strong possibility for helping Alicia regain her swallowing function. All other priorities were tossed aside so that we could go and give Alicia the best chance to recover one of the “normal” things she missed the most—eating. Even Christmas that year lost a bit of its importance as we focused on preparation for our trip to Cleveland. In a family not unfamiliar with adventure, this trip was exciting to both of us. Alicia always loved to go for long rides and found ways to occupy herself on any type of ride. I had traveled with the kids many times when they were young, visiting friends from out of state. That was always something that they looked forward to and enjoyed. This journey was no exception. We rigged up a television with a VHS tape player in it on top of a commode in the van and brought all of Alicia’s favorite movies with us. The large conversion van with a wheelchair lift that we had purchased now became the perfect vehicle for a serious road trip. We were entirely organized and ready to go days before Christmas. We planned to celebrate Christmas with a family meal and spending time together before we left for a fair amount of time. A few days prior to our planned trip the weather reports started to speak of the possibility of a winter storm coming from the Midwest and hitting the Northeast on Christmas Day. We weren’t all that worried; we figured we had a heavy vehicle with adequate snow tires. I felt very com- fortable about driving to Cleveland, even if there was to be a bit of snow. I have always loved driving in the snow, as well as taking part in an adventure, so in my mind the trip was actually starting to sound a bit more exciting. Paul wasn’t exactly thrilled with the idea of Alicia and I being on such a long road trip in the middle of a snow storm, but he knew better than to try and talk a stubborn Irish woman out of anything she had set her mind to. On Christmas morning the forecasts started to show the storm was increasing in strength. Now a major snow event was expected to dump a few feet of snow from the Midwest up through New England. Initially the snow was supposed to start in the late afternoon, but as flakes began to fall in the late morning we started an all-out race to get out the door. I called my wonderful friend Elaine, who lived up around the corner. We had been in frequent contact throughout Alicia’s hospital stay and once she was home. Elaine, Tom and her kids were the amazing friends who practically adopted Bryan throughout Alicia’s stay in the hospital. Elaine had invited both of the kids to come up after school and to hang out and eat over anytime. From what I understand, Bryan took them up on the offer as frequently as possible and would be found there most nights, having supper with their family and then hanging out, doing whatever they were doing for the evening. As we’d prepared for the trip, Elaine, Sue and a few other friends had talked about joining us for the ride out to Cleveland. Being such an open-ended trip, however, made it impossible for anyone to get the time off to travel or stay with us there. I called Elaine around noon and told her we were going to have to head out of town in a hurry in order to make it to Cleveland by noon the next day. At least we could make progress, even if it was going to take longer than expected. Her husband Tom came down and helped Paul quickly load up the van. We tucked Alicia in with her wheelchairs, medical equipment and enough clothes and supplies to last for several weeks. At that point Alicia’s mobility was very limited; she still had a tracheostomy and was fed exclusively by g-tube. We had to bring enough of the tube feedings and trach equipment to last for potentially three weeks or so. Finally, after good-byes that seemed too short and some last-minute preps, we got on the road at just around 2 pm. The thought of postponing the adventure that represented Alicia’s best hope for being able to eat again never crossed our minds. We were entirely blind to what problems might lay ahead. I just knew we had to get there. Nothing would stop us. As Alicia and I left our driveway the ground was already covered with a blanket of snow, which was coming down more heavily as the minutes passed. We knew we were going to have to take it easy. We took about an hour to get through Danbury, a trip that usually took about a half an hour. I knew now that we were looking at doubling our expected times, especially in areas where it was snowing. Sleet came down with the snow, and we began to have problems with the windshield and the wipers freezing as we crossed the border into New York state. I could no longer see the lines in the road at all. We couldn’t have gone any faster than 30 mph the entire way though the state, and visibility was becoming more of a problem with every mile. Deep down inside, somewhere in my sane mind, I was getting a bit scared about being out there in those treacherous conditions. Alicia, on the other hand, was oblivious to the dangerous situation on the roads. As I looked through the rearview mirror, I saw her sitting and watching a video we had turned on as we left the house. I could imagine her excitement just under the surface, born of a new hope that we would find answers in Cleveland that would perhaps allow her to be able to eat again sometime soon. On we drove. As we came upon the fifth exit in Pennsylvania, I saw a state police car up ahead, directing the few cars on the highway to get off at that exit. There was just over a foot of new snow on the ground, with another two feet expected before the morning. Conditions continued to deteriorate, forcing them to close the highway. We were directed to the only open establishment at the exit, a convenience store gas station. About fifty cars filled the parking lot, as well as others parked along the main road before and after the entrance to the driveway. It was impossible to get into the parking lot, so I parked strategically out along the main road with the van pointing toward the highway. I talked it over with Alicia and then made my way to the convenience store to try and get any info I could about what was happening. I left the van running so that Alicia could stay warm, with a window open a crack for ventilation. In the store the floors were covered with people laying down on blankets and coats. The word was that the highway was going to be closed throughout the night. I made my way back to the van to let Alicia know what was going on. We had no choice other than to wait it out…or did we? After examining the map at length, I found an alternate route that would take us on some secondary roads to route 80, which ran parallel to 84 about sixty miles south of where we were. We had heard that route 80 was still open. I was very conscious of having to be in Cleveland at 11 am for our initial interview/exam in order to start the program on time. The twenty-sixth was a Friday; if we didn’t get going this week it was unclear when we could begin, as initial exams were only offered twice a week. I was very anxious about the situation and felt that we absolutely needed to be there by the next day at 11 am. We were only about a quarter of the way through our trip. I made a few phone calls to touch base with my friends back home. A team of cheerleaders back in Connecticut waited at the other end of the phone to hear about what was going on, as well to provide any help they could. I discussed the idea of making my way along the back roads in order to drive down to route 80. The plan we decided on was to wait until midnight and see if there were any updates about the highway possibly reopening. Just before midnight I made my way back to the store and asked about the situation. Nothing had changed; the snow continued to fall heavily. We decided to try plan B. The roads were slick but passable, and I took it slow. I followed the map, and I was making decent progress south on route 196. At about the thirty-mile mark after our departure from the store, we started to notice that we were making a fairly steady assent, at first gradually, then increasingly steep. Visibility was poor as we made our way down the back roads in the middle of the night. It looked as though they had been plowed, but new snow was piling up. We tried to make it from route 196 to 940W, which would have taken us out onto 380 for a quick jaunt to route 80. We found that 940 was impassible, so we headed back to the middle of a town that was supposed to have a right turn that would take us on 611S. We went through the town without seeing the turn off; everything was covered with snow, including signs. I decided to turn around and make our way back about a mile to the town. As we approached from the opposite direction the sign was clearly visible. I attempted to make a left turn onto route 611, but noticed as I approached the corner that the road had perhaps not been plowed at all. The van was a fairly heavy vehicle; I felt that once we got around the corner and started steadily up the road we would be fine. Several attempts to get around the corner proved fruitless; there were huge piles of snow on either side of the road. I was about to accept the apparent impossibility to make the turn under those conditions, but decided to give it one more try. Backing as far as possible to get the best angle ahead of me, I made a run at the hill through a very narrow opening to the unplowed road. The van immediately started to skid off the road to the right, and I found myself jammed sideways in an approximately four-foot high snow pile at the side of a dark road in the middle of the eastern Pennsylvania mountains. If I’d had one shred of sense in my otherwise focused mind, I would have recognized it as a dangerous and perhaps losing battle. Instead, I saw only a challenge. I got out of the van and made my way through knee-high snow to the back of the van to get the shovel packed inside. When I say packed, I am talking crammed in, along with all manner of supplies—full-to-the-brim-with- stuff packed. I opened the door… Yes, there is a God; the shovel was right inside. Thank you, Paul, for the nice packing job! Partway through the shoveling-out-the-van event, my friend Sue called to see what kind of progress we were making. Hmm… Tough question, considering it was about 1 am and I had fallen off the grid somewhere in a state that up until then only seemed annoying because it meant a forever-long drive to pass through. Well, new day, new perspective, I suppose. I talked to Sue as I shoveled my way out of the pile of snow that was snuggly wrapped around “the gladiator.” On to plan C.
After digging for a good half an hour, and a couple of tries of maneuvering the van forwards and backwards, eventually we were freed. I made my way back along the same roads that we’d come down and then took a bit of a longer road that carried us to the next exit on the highway. It was 3 am, and they had just opened the highway. Perfect! No time lost—just a little sanity. The conditions on 80 were much better, allowing us to maintain a steady pace. We arrived at the Pennsylvania/ Ohio border at around 9 am. The roads were still bad, but my only concern was making it to Cleveland in under two hours, a feat that seemed nearly impossible. I kept moving and tried to contact Marci Freed’s office to ask if we should come, as we were running a bit behind schedule. Her office contacted her and they got back to me at about 9:30, saying that I would be fine if I could make it in by noon. That phone call was the last time my speedometer read anything close to the speed limit, by the way. We approached Cleveland from the northeast side of the city and made it inside the city limits by 11:50. At each stop light, I reexamined the map of the city. As we made our way down the main route toward the hospital, coming up fast on the noon hour, I realized we were not going to make it. I called the office and was given the news that we would not be able to be seen that day. They would call me on Monday to set up a time for our screening next week. Now, to most people that might not seem like too big of a deal. After all, within a couple of days we would hear about when we could start the process. However, we did not come under the category of “most people.” I had been driving in a blizzard for just under twenty-four hours, awake for more than thirty. I had driven about 650 miles with my precious cargo Alicia who, most importantly, hadn’t eaten a thing in the fashion that she preferred in more than ten months. I was totally frazzled, frustrated and in tears. To make a long story short, I would have contacted the president of the United States if it would have helped at that point. Instead I contacted our pediatrician, Dr. Diane Fountas, who in turn contacted Marci Freed’s office, telling them of our overwhelming frustration and intense journey. Within an hour we were called and told that we had an appointment for Saturday morning at nine o’clock. Thank you, Diane! Little did we know when we checked into the Ronald McDonald House that we would be staying there for more than a month. We went back and forth to the hospital every day as Alicia underwent the E-Stim treatments. We can’t say enough about the wonderful treatment that Alicia received while in Cleveland or the amazing hospitality that was provided by the volunteers who ran the Ronald McDonald House. The setup there was amazing; with all the amenities and comforts it would provide, we may as well have been staying at a five-star hotel. We explored the area in our spare time and had many opportunities to relax and enjoy each other’s company. Although it snowed twenty-eight of the thirty-one days we were in Cleveland, our stay gifted us with hope; we were grateful to be a part of the whole program there. Although Alicia underwent treatments every day, no change in her swallowing function became apparent, other than a few hopeful moments along the way. We drove home from Cleveland on Jan 28 with little hope there would be any change. We flew back a week later for a full evaluation, including imaging and barium swallows, a test that uses a special dye to track the movement of liquid during swallowing. The X-ray machine produces a series of pictures of the barium liquid as it passes through the mouth and progresses to the stomach. As Alicia attempted to swallow the liquid, the images clearly showed that no progress had been made. Alicia continued to have absolutely no swallowing function whatsoever. After coming home from Cleveland, Alicia continued speech therapy, as well as PT and OT, at Gaylord Rehabilitation Hospital. We appreciated getting life back on track, even though we were not entirely sure what this new track entailed. She then made a choice to continue with her life’s dream of completing high school and going to college to become a teacher, rather than concentrate on continued therapy. Her plans were taking shape to continue at Holy Cross in the fall so that she could eventually graduate from high school.